In a move likely to receive heavy backlash at least up to the U.N. climate conference (COP20) in Lima, Peru in December, Peru's government just rolled back environmental regulations in an effort to boost mining. At the end of this year, 15,000 people from 194 nations will gather in Lima to talk about ways to mitigate greenhouse gases. This makes Peru's decision to strip the nascent Environment Ministry of jurisdiction over air, soil and water quality standards, as well as its ability to set limits for harmful substances, seem ill-advised in both the short- and long-term. The changes in the law also revoke the ministry's ability to establish nature reserves that are exempt from mining and fossil fuel drilling. In a clear bid for economic growth over environmental sustainability, Peru's finance ministry said last month that the changes would "untangle at least $11 billion in hydrocarbon projects," and that it would add at least 1.5 to three percentage points to economic growth in the next few years. Peru's environment minister and COP20 president Manuel Pulgar Vidal voted against the bill, which also streamlines environmental impact studies to a maximum duration of 45 days. Over 100 environmentally minded groups including the Sierra Club, WWF, and Oxfam wrote a letter to Vidal and Peruvian president Ollanta Humala Tasso protesting the law, saying "this newly proposed law sends a very bad signal which is made even worse considering Peru's role as COP20 President:"
… It rewards those parties who do not comply with current environmental rules in Peru; it yields to the strong pressure of economic actors to modify environmental standards to facilitate the expansion of the fossil fuel and mining sectors whose impacts to the environment, including Climate Change, are widely recognized. According to Reuters, Humala was elected partly on promises to make sure mining, which makes up about 15 percent of the gross domestic product, does not come before the environment or local communities. But with mineral exports dropping due to low commodity prices and lower-than-expected output, and economic growth slowing to five percent in 2013 from 6.3 percent in 2012, the government passed the law as an emergency measure. The forecast for growth has dropped to about 4 percent for this year according to the World Bank. This law could be in violation of free trade agreements with the U.S. and E.U. that stipulate that environmental regulations cannot be relaxed to generate investment. According to the AP, officials are currently studying the measure. In May the Peruvian government declared an economic emergency in 17 indigenous communities along the River Marañon in the Amazon basin saying that the communities were at significant risk from oil contamination. Puinamudt, a collective of indigenous organizations, said that the government has failed to provide aid to their communities such as testing the water quality in rivers and introducing portable water purifiers to affected communities. 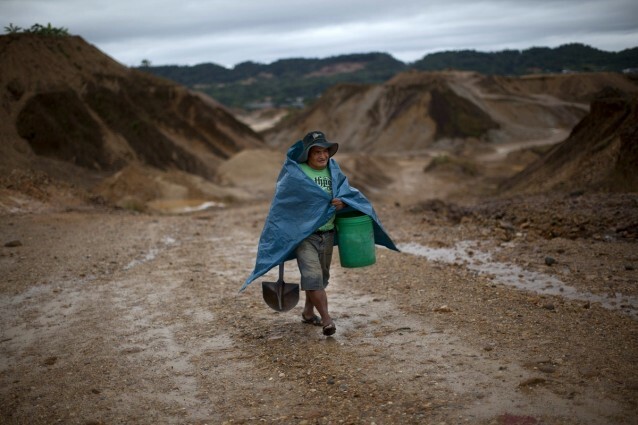 Even with regulations in place, illegal mining is a major environmental hazard in Peru. "The illegal miners have pushed deep into the Amazon jungle to pan in rivers and creeks, most notably in the wildlife-rich Madre de Dios region," said Juan José Córdova, leader of the energy sector at KPMG, Peru. "It is estimated that 30 to 40 metric tons of mercury are dumped into the environment annually and burned off after amalgamation — generally without even using rudimentary technology to protect workers' health or capture waste or fumes." Liquid mercury is used to extract gold particles. The mercury can make its way into fish species that are consumed by humans and can lead to mercury poisoning. Deforestation, a major issue with illegal mining, is also detrimental to climate goals as forests are major carbon sinks.